Parental Dementia, Advice from a Loving Daughter for all of us. First of all, it’s not all bad news. When my mother was diagnosed with dementia over a year ago, no one was very surprised. She had been time traveling for a while, speaking of long dead people as if they were alive, mistaking the year for a happier one. I was prepared for the diagnosis. And saddened. My mother has always been a woman of strong opinions, quick comebacks, and a bawdy sense of humor, and I thought I saw that fading from my life. The first order of business was finding her a place which would keep her safe. 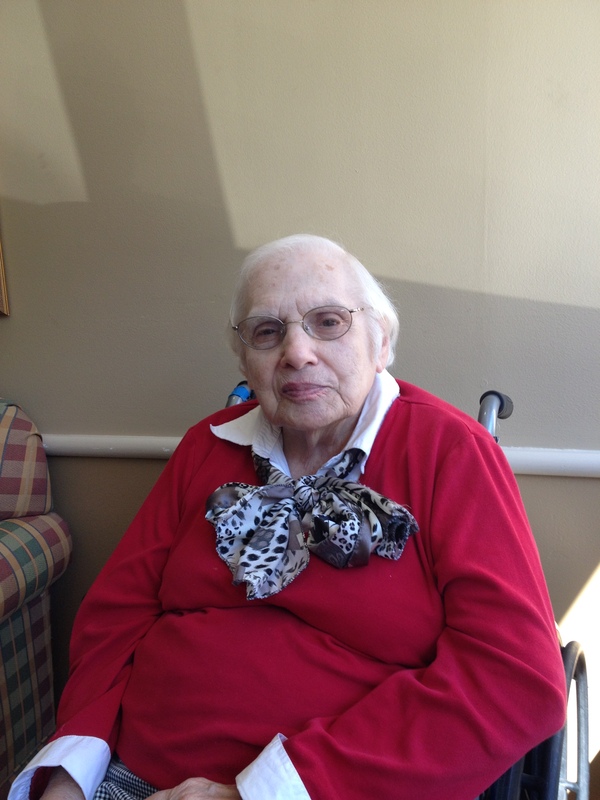 She had been in assisted living for about a year, and luckily the same facility has a memory care unit which we toured. 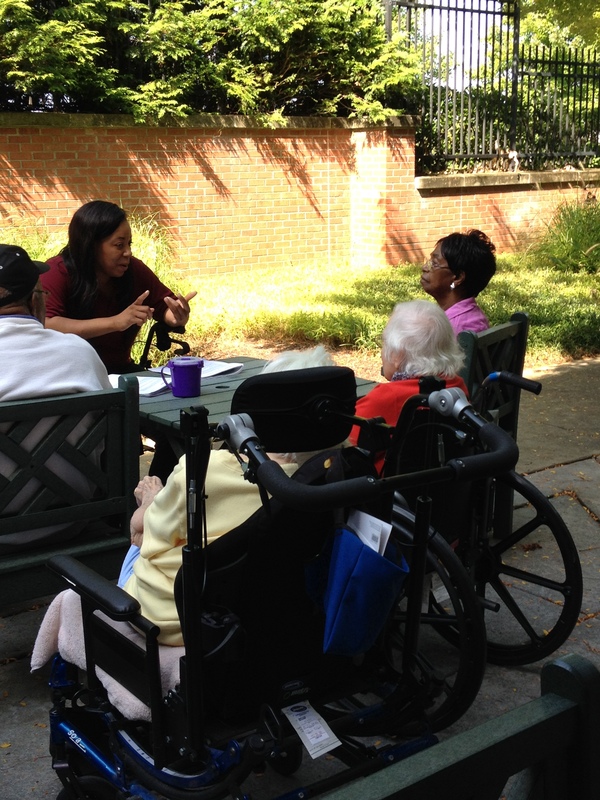 It was clean and cheerful and the staff was obviously caring and active with the residents. It’s a small unit, maximum 22 residents, and what I liked best was that the staff had all been there more than five years, some for much longer. Mom has now lived there for about 15 months and I have seen spontaneous hugs, laughter, and gentleness. I have seen an aid put her hands on each side of a troublesome resident’s face and deliver a big kiss to the forehead, which diffused anger and brought asmile. I have heard some members of other families complain that there are not enough activities, but I’ve seen dance classes, games of catch, discussions of court cases, art therapy, music therapy, and quizzes. Mom and her fellow tenants have formed their own cliques. She likes to mother one particular friend so much that she is not allowed to sit with her at meals. Mom concentrates so hard on making sure her friend eats that she forgets to eat. There’s another friend who has a similar sense of humor and they insult each other cheerfully alll day. There are sad cases in the corridor, one woman is always in tears and cannot find the words to express her sorrow. Another youngish woman constantly cradles her “baby,” a beautifully dressed, lifelike doll. We all congratulate her on her adorable baby, and she basks in the glow. There’s a tall, powerfully built man who always has his jacket and baseball cap on because he’s ready to leave. I have learned many things from my mother’s situation. I have learned to time travel along with her. When she asks how my father is, I tell her he is happy and well. If I betray the fact that he has been dead for 28 years, she will relive her grief and it would be useless because in a few hours she will have forgotten again. I have learned that when she is talking about “Dad” she might be talking about her own father and that in her world her parents are also still alive. Finding the right place for mom to be comfortable, makes the entire family comfortable. I have learned that I need to prepare myself for a similar eventuality. My mother is 97 years old and is healthy enough to live another five years as did her oldest sister. Because she forgets that she cannot walk unassisted, she has broken over the last two years both arms, one of them twice, a hip, and seven ribs. During the day, the staff watches her, but at night they cannot stay in the room with her, so we have a private aide every night. For the facility, private aide, supplies, and sundries, it costs between $9000-10,000 per month. I now have long term care insurance. I have learned that I must have a will, an advance directive or living will, and a person whom I trust to do things properly. I have these on paper and my representatives, know what is expected. Most importantly, I’ve learned that I cannot do everything. When I worked full time and took charge of my mother’s life, I exhausted myself. Literally, I was used up and had nothing left. I walked away from my job five years early, which I was able to do financially, and found I could have a life. I’ve learned I can do some things I thought I couldn’t, including aiding in my mother’s hygiene. I let other people help out. I’m allowed to laugh and I’m allowed to cry. I’ve made my goal very simple. My mother deserves to be as happy and comfortable as possible in her circumstances. And so do I. « Squirrel King Rescue, and if you haven’t been to Collegeofcuriosity yet, why not? What a beautiful piece! I’m glad you’ve found a good place for her, and that she’s able to continue interacting with her world–even if it’s not the one you and I inhabit. My father, sadly, was very deaf and nearly blind when his mind began wandering, and so he was largely disengaged from connecting with anyone or anything. The one thing I found made him happy was watching birds, so we put a feeder and a birdbath right outside the window from his chair and he would watch the birds and tell my Mom all about what they had done when he saw her next. Special kudos for having learned to let go and not try to manage all of her needs yourself!